The 5th of November or otherwise known as Bonfire Night, Firework Night or Guy Fawkes night in the UK is an event that fills many pet owners hearts with dread. Many of you outside the UK will be aware of this English verse due to it being used in the film V for Vendetta however you maybe unaware of its origin and why the 5th of November is an important date in Britain. The 5th of November has been celebrated with bonfires and fireworks in the UK since 1606 when a law was introduced in the UK to observe the day in 1605 when the plot to blow up the House of Lords and assassinate King James 1st was thwarted. Guy Fawkes was one of a group of conspirators that had set the explosives under the House of Lords and was found next to several barrels of gunpowder. Hence why the event is also known as the Gunpowder Plot. On hearing the news that the plot had been thwarted Londoners set bonfires to celebrate and it has now been celebrated in this way for hundreds of years. That is a very simplistic overview of Guy Fawkes night, there are deep religious undertones to the event with King James 1st being protestant and the conspirators being Catholics. Some people celebrated the attempt on the King’s life and others celebrated the foiling of the plot. Nowadays unless you live in a very sectarian area of the UK such as Northern Ireland and parts of Scotland the history is something you learn briefly at school and holds no particular resonance for you. For most people the 5th of November is a time for family get together’s, fireworks in the back garden, building bonfires or attending organised events. The subject of fireworks is quite emotive in the UK amongst pet owners whose animals are severely stressed by the noise. I am not anti fireworks as some people assume I am. I am anti unregulated displays and inconsiderate people setting them off at all hours between the time that Fireworks go on sale in October until after the new year. One night a year I can plan for and try to ensure my dogs are kept as calm as possible. Nights when I don’t know if they are going off or not cause me a real problem. Even if there were several nights during the year where fireworks were set off at organised events I could plan for them. However what will happen now is that every night as soon as it gets dark my 10 year old Weimaraner Mollie will become incredibly stressed in anticipation of the loud noises that the night-time will surely bring. I am extremely unlucky in the fact I have three dogs who become stressed by loud noises – strong winds, thunder and lightning will also trigger a response but fireworks should be something I have some control over. On the 5th of November for the first time I posted a picture of Mollie on my personal Facebook page. There’s nothing unusual in that you might think. However the picture showed just how stressed she was, lying in the bottom of the shower cubicle (we placed some throws and cushions in there to ensure she was as comfortable as possible) tongue hanging out as she panted with stress and a look of sheer terror on her face. A happier dog than Mollie you would be hard pressed to find, she has a tail that wags constantly – even when she drinks. You only have to softly call her name and you can hear her tail thumping against the floor or whatever she is standing next to. Her happy demeanour changes beyond recognition on the night of November 5th. My husband wasn’t quite so careful on Facebook with his language regarding his thoughts on fireworks. Although I completely agree with his sentiments his language was highly emotive and to some offensive. Those whose pets suffer the same way ours do, rushed to support him. Those who didn’t took offence, my husband really couldn’t care less what people think of him. I like the fact he says what he thinks and admire that quality in him. To change people’s minds however you need to be less emotive and try to reach a compromise. A difficult thing to do when three out of the four things he loves most in the world are suffering in the way they were on the 5th November. What we both can’t stand is that we can’t tell our dogs it is going to be OK, that there is nothing to be scared of. Not being able to comfort them is distressing and the older they get the worse they react to the noise. We have tried many things to try to relieve their stress. We’ve bought D.A.P diffusers which send out calming pheromones (it’s the smell of a lactating Dam) even after following the guidelines to the letter it did nothing (it also didn’t stop them having separation anxiety either). We’ve tried herbal remedies, noise exposure therapy which involved playing a DVD with firework noises on it at a low-level. They never reacted to the noises at any level because they sussed out early on that they were coming from the stereo. My dogs aren’t stupid and Weimaraner’s are known as the dogs with a human brain. We are careful not to change our behaviour pattern and become anxious ourselves during storms or firework season. Many people have suggested to us that the dogs are picking up on our stress levels, which if we were stressed out I would accept. I can not be blamed for a dog being stressed out due to thunder and lightning when I have slept through it until a 40 kilo dog has jumped on me. I love storms, I always have done, whenever there is a storm I sit at the back door and watch it. As I said we have tried everything! Travis our first Weimaraner was exactly the same with fireworks and storms. Our vet at the time was happy to provide drugs to sedate him due to his extreme levels of anxiety. Unfortunately, for us the vets are no longer happy to provide sedation and I can’t blame them. A sedated dog has to be watched like a hawk so that they don’t injure themselves. Travis like our other three would fight the sedation, he would no longer react to the fireworks but would insist on bombing around the house like a mini drunk. The sedation would last hours and would mean that one of us would have to for go sleep whilst he was supervised. I can’t imagine how difficult it would be to keep an eye on three of them under sedation and nor would I want to sedate Frankie and Willow. Although they are frightened they aren’t as frightened as Mollie. Each year I wonder if she will live to see her birthday the following day or if she is going to drop dead from a heart attack. The stress that fireworks cause pets is what those who insist on setting off fireworks in their back gardens don’t see or refuse to acknowledge. I posted the picture on Facebook to show them what a stressed dog looks like, not to say Fireworks should be banned as I don’t believe that. I just think that fireworks should not be sold to the general public and should only be used in licensed organised displays. To write this piece I reached out to my friends on Facebook whose dogs were also suffering due to it being firework season. Laura was kind enough to tell me about how her dog, pictured below. 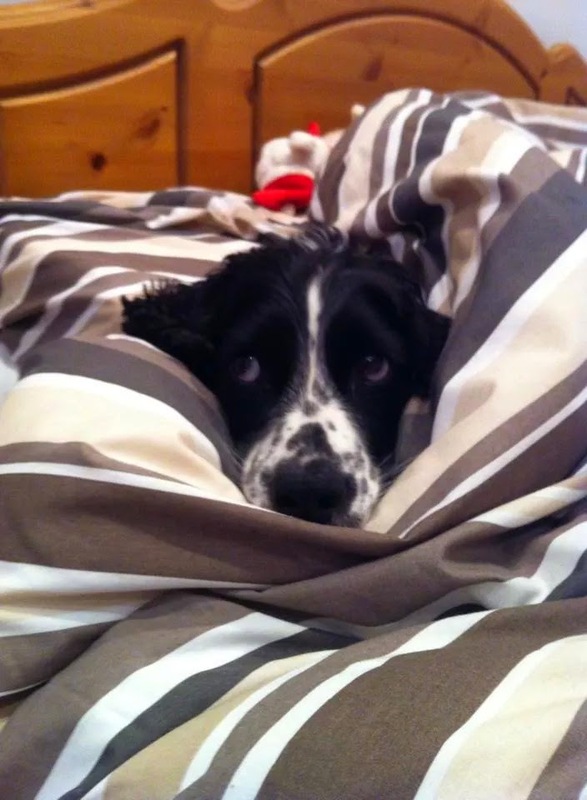 Chester is a three-year old Sprocker (Cocker spaniel & Springer spaniel cross) reacts badly to fireworks. Chester by kind permission of Laura D.
On the 5th November my news feed was filled with pictures of dogs, of all shapes and sizes that were terrified by fireworks. There was a picture of an enormous German Shepard that had crammed itself under a dining table, a Rottweiler that was hiding under the stairs. Yet there was very little sympathy shown for these dogs or their owners by people who either didn’t have pets who reacted to fireworks or were non pet owners. We claim in the UK to be a nation of animal lovers yet when it comes to fireworks people seem to ignore the effects on pets or wild animals. It’s not just the stress that fireworks cause to animals that bother me. Many people including children are seriously injured by fireworks every year. The Eye Care Trust states that each year in the UK ten people lose their sight permanently and 300 people suffer serious eye injuries due to fireworks. The Royal Society for the Prevention of Accidents (ROSPA) states there were 990 accidents in 2005 due to fireworks, unfortunately this was the last year that the figures were collated by the Department of Trade and Industry. The NHS Choices website provides some information behind why fireworks cause so many accidents, providing facts like Rockets can travel at speeds up to 150mph and that the majority of accidents involving fireworks happen at family gatherings or private parties. These are all facts that shouldn’t be ignored. Fireworks are not only stressful for animals but also very dangerous. Why on earth would you sell explosives to the general public? Why shouldn’t they be limited to professionally organised and licensed displays? It just seems like common sense to me. Whilst researching this blog post I came across an interesting article in The Telegraph which talks about the environmental damage that fireworks cause. When a firework is released it sends out a shower of toxic chemicals like Aluminium and Barium. For more information on the health hazards to humans from fireworks read this article on the BBC website, it is a real eye opener to what we are willingly polluting our environment with. Not only are these chemicals harmful to humans but they are also polluting water courses and the soil. These were elements I had never even considered before writing this post. I am not a killjoy, I actually want to reach a compromise with those among you that love fireworks. I can put up with one or two nights a year of fireworks being released although it comes with consequences for my dogs. Many other countries around the world have limited or banned fireworks at private parties. My issue is that from when fireworks go on sale from October fireworks will be released every night from then until after the New Year. Due to not knowing when these fireworks will be released my dog’s lives (and many other pets in the UK) will be made a misery. Mollie like Chester associates the dark evenings with fireworks and lives in constant fear during these long nights. If fireworks were just released on 5th November and New Years Eve at organised displays, I am sure that many of us with pets could cope. The benefit of organised displays would also be that injuries due to fireworks would be reduced and so would the environmental impact. To me and many others this seems like a sensible way forward. If like me you share this view please sign this e-petition, banning the sale of fireworks to the general public in the United Kingdom. I am not trying to destroy over 400 years of tradition in the UK, I am trying to find a compromise. Many thanks must go to Laura D for sharing her story and the picture of Chester. I remember my dogs being so freaked out by fireworks and storms. We lived in a highly regulated state at the time so not many people set them off because they risked receiving a ticket. I am sorry that your dogs as well as others suffered. I hope a compromise is reached. Thank you for taking the time to read and comment on my blog it is very kind of you. Unfortunately there were lots of fireworks again last night causing a great deal of distress to my three and many of my friends dogs also. I really hope that we can get somewhere with the e-petition so that we can get some regulation although I realise it would be difficult to enforce. I don’t have a dog, but I do have an elderly cat who hates fireworks. So I put her in my bedroom with the window and blind shut and a lamp on and I put on radio 4 (just people talking mostly) and this seems to calm her as when I go up to check on her she’s usually fast asleep. Thank you for reading and commenting on my blog it is always greatly appreciated. We have tried absolutely everything with our dogs to get them to calm them down. 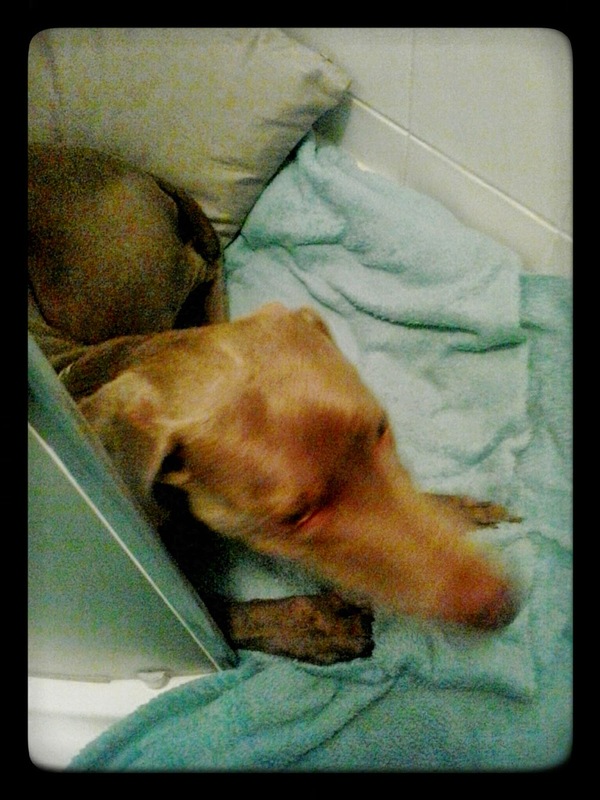 Mollie is happiest if just left alone in the shower cubicle. There is no window in the bathroom so it is the darkest room in the house and the shower tray is nice and confined. I suppose she is going back into a wolf like state of thousands of years ago, as in crawling into a hole in the ground or a cave and waiting for the perceived threat to pass. I am glad you have found something that works for your cat, the worst bit about being an owner is not being able to explain to them it will be ok. Exactly hun but unfortunately around here they seem to let them off every night from late October until after the new year!